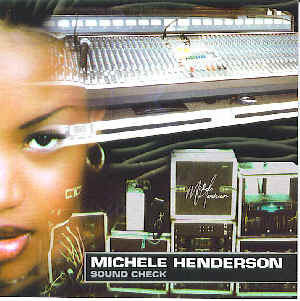 SOUND CHECK by MICHELE HENDERSON is her third album CD. This rising star from Mabouche, Grandbay in Dominica reveals the potential that has catapulted her into an internationally acclaimed singer. The main track "Inspire' and a revised "The Beat Goes On", among others demonstrates her skills on stage at the annual World Creole Music Festival and on stage overseas, especially in Europe. b>Sound Check was awarded Album of the Year for 2002 by the Foundation for Artists Musicians and Entertainers (FAME), a foundation established in Dominica. Further, "Sing for Africa" (Track 4) won Song of the Year, and Track 7 "Pas Lesse Mwen" reached Number 1 on the Top 40 Zouk Charts on 3 radio stations in Martinique, for 3 weeks in a row. Winner of FAME Award for "Album of the Year" in 2002. *FAME Award "Song of the Year" 2002.